I’ve been an occasional headphone listener since before I was an audiophile, but only in the past couple years have I migrated to doing most of my listening through headphones. I don’t mean that I’m out and about with an iPod -- though that happens occasionally -- or that I’m forced to listen to headphones while at my desk at work. I listen to my usual high-quality sources through a headphone amplifier with a variety of very excellent headphones. As I did more of my listening through headphones, my curiosity about electrostatic headphones grew. For many years, electrostatics have had an excellent reputation for sound quality among the most dedicated headphone listeners. As I looked through the liner notes of my favorite recordings, Stax headphones kept showing up as having been used for monitoring. To satisfy my curiosity, and because I’ve taken on the task of reviewing headphones for SoundStage! Xperience, I thought it high time I auditioned an electrostatic system for myself. I don’t know whether Stax calls their headphones Earspeakers because they find them more akin to loudspeakers for the ears than to regular headphones, or if it’s just an awkward translation from the Japanese that has stuck. The SR-507 Lambda Signature Earspeakers ($1099 USD) -- which from this point on I’ll call headphones -- were introduced in late 2010 and are the current top model of Stax’s Lambda series. The product description’s sloppy English translation yields relatively little useful information about the changes made for the current design: The new diaphragm is thinner and encased in a resin material. The headband assembly has new click-stop adjustments to make the earcups stay where you’ve put them. The padding around the earcups that actually touches your skin is genuine lambskin, while the headband’s padding is synthetic leather. While the headphones themselves are about average in weight at 10.4 ounces, the nondetachable cord is heavy, adding 6 ounces to the weight -- I definitely felt it pulling on the ’phones as I moved my head about. Thankfully, the cord is not at all microphonic. Funny-looking though they might be, I found the SR-507s to be quite comfortable. There is one semiserious flaw in the design of the SR-507’s headband. The bracket that holds each earcup is connected to the rest of the headband by a single small screw that passes through a metal sleeve. This arrangement allows the earcup to pivot very slightly, for a comfortable fit. The problem is that, over time, the pivoting works the screw loose. I was momentarily horrified when, on picking up the headphones, one earcup came off the headband assembly in my hand. Fortunately, neither side fell to the floor, and the tiny screw was not lost. I had to turn to my electronics kit to find a screwdriver small enough to reassemble the SR-507s, but everything was quickly put back in order. Stax should re-engineer this connection to be more robust. In the meantime, they should ship the product with some spare screws and a compatible screwdriver. Like electrostatic speakers, electrostatic headphones function differently from dynamic headphones and speakers. They have a charged diaphragm between two conducting grids. Changes in the audio signal create an electrical potential between the grids and the diaphragm to drive the latter back and forth to move air and thus create soundwaves. It is an inherently balanced design. With a very thin diaphragm being driven over its entire surface, an electrostatic driver should be able to move extremely fast and be largely free from resonances -- although that doesn’t mean that its mounting structure or enclosure will be resonance free. The membrane has perforations that enable faster, more precise movements -- because some air is allowed to pass through them -- but the reduced surface area and leakiness will compromise low-bass performance and punch. This arrangement also results in an extremely open feeling when wearing the headphones. The downside is that these open-backed ’phones provide almost no isolation from ambient noise, and leak a tremendous amount of sound into the room. Because electrostatics operate on a different principle from normal headphones, they require a special type of amplifier. Stax offers a number of different amplifiers, one of which I tried and comment on below, but most of the observations in this review are based on my driving the SR-507s with WooAudio’s GES headphone amp ($1450). 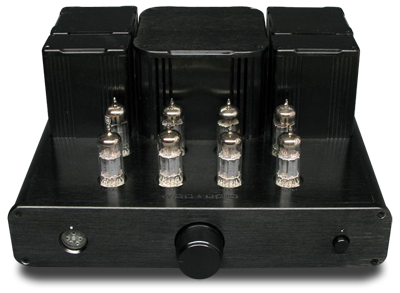 The GES is an all-tube design that uses four 12AX7 driver tubes and four 6S4 power tubes. 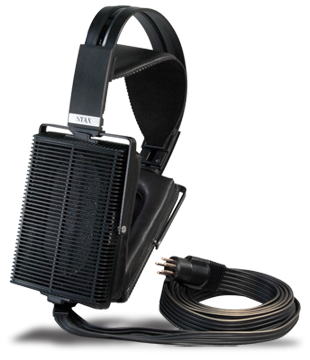 Its frequency response is specified as 10Hz-80kHz, -3dB, with a signal/noise ratio of 100dB. Its die-cast aluminum chassis measures 13"W x 6.5"H x 10.5"D and weighs 22.5 pounds. You’ll need to allot extra space on your equipment rack for the GES, because it generates an awful lot of heat. Most of that heat comes from the tubes, whose sockets are mechanically coupled to the chassis, so that the entire casework is used as a heatsink. After the GES had been on for an hour or more, anywhere on its metalwork was hot to the touch. Even the aluminum volume knob got warm. Although Stax headphones are inherently balanced, which means that their final driver stage is balanced as well, the GES has only two single-ended inputs. I assume that one of the driver tubes is actually being used as a phase splitter. It would have been nice to see at least one balanced input, as all the required circuitry is there, other than a four-channel potentiometer. The source selector switch would also need to be implemented differently, but such an arrangement would add only very modestly to the parts cost, and could realize significant audible benefits if the GES is used with a balanced source. There is also no provision for allowing the signal to pass through the GES and on to the rest of your system. WooAudio offers many options for the GES; though these are not among them, I suspect that at least the latter could be accommodated. Woo also makes the WES, a fully balanced electrostatic headphone amplifier with more power, tube rectification, and a beefy outboard power supply ($4950). The SR-507s operate differently from any other headphones I’ve heard, and they sounded immediately different. What first struck me was their incredible sense of openness. Many open-back designs reduce the claustrophobic effect that is experienced through the vast majority of headphones, but the SR-507s eliminated it entirely. That openness allowed voices and instruments to breathe, and their notes to decay, almost as they do in real life, or through the very best loudspeakers in the best rooms. (Maybe they are Earspeakers after all.) All naturally recorded acoustic instruments can amply demonstrate this characteristic, but it was probably most obvious with recordings of only one or two instruments -- such as the sonatas for violin and piano (by Mozart, Stravinsky, Strauss, and others) on Mira Tujakbajewa and Nino Gurevich’s Pearl of Passion (SACD/CD, ARS Produktion 38009). They were similarly convincing when rendering solo piano -- as on Resonances, Hélène Grimaud’s collection of works by Mozart, Berg, Liszt, and Bartók (24/96 FLAC, Deutsche Grammophon/HDtracks), or Terhi Dostal’s disc of Brahms variations (SACD/CD, Siba SACD-1006). All of these recordings are made with the microphones far enough away from the stage that you get the sense of real instruments in a real room, rather than the dead sound that results from close miking. Not only could the SR-507s get the decay of the piano’s notes correct, they also convincingly rendered the percussive attack. Sometimes it seems as if people -- including most headphone and speaker designers -- forget that the piano is a percussion instrument. The attack can be soft, or it can be fast, hard, and definite. Preserving both extremes and the entire continuum between them is essential for conveying the nuance of a piano performance, whether of classical, jazz, or pop. The SR-507s did this better than any other headphones I’ve heard -- and nearly as well as my reference loudspeakers, the Esoteric MG-10s. The SR-507s’ prowess with transients wasn’t limited to pianos. Whether I was listening to pizzicato strings, plucked banjos, or fingerpicked guitars, I could not only determine which of the above I was hearing, but appreciate the subtle variations in the techniques applied. Quick percussion sounds -- closed hi-hats, sticks against drum rims, and wood blocks -- all had lightning-fast attacks with no extra zippiness or other distracting hash. I’d heard good transients from headphones before, but it had always been close to right, never right on -- until now. Another aspect of audio performance that is very important to me is accurate representation of instrumental and vocal timbres. Driven by the GES, the SR-507s were slightly warmer than what I would consider strictly accurate. Perhaps the glow of the tubes found its way into making instruments and voices glow as well. It didn’t really matter which instrument it was -- whether listening to an oboe, violin, trumpet, saxophone, or electric guitar, I came to the same conclusions: The sound was just slightly softer than reality in a way that I could notice but not fault. Voices, too -- from opera divas to Alison Krauss to Johnny Cash to Bob Dylan -- were just to the sweet side of the real thing. The SR-507s also retained almost all of the textures of those instruments and voices, whether the rasp of bow on string, the reediness of woodwinds, or the gravel in a voice that has undergone a lifetime of too much smoking and drinking. Further experimentation using the Stax amplifier suggested that the very slight smoothing of textures came from the all-tube GES rather than the SR-507s. This was not, however, an overtly tubey sound. 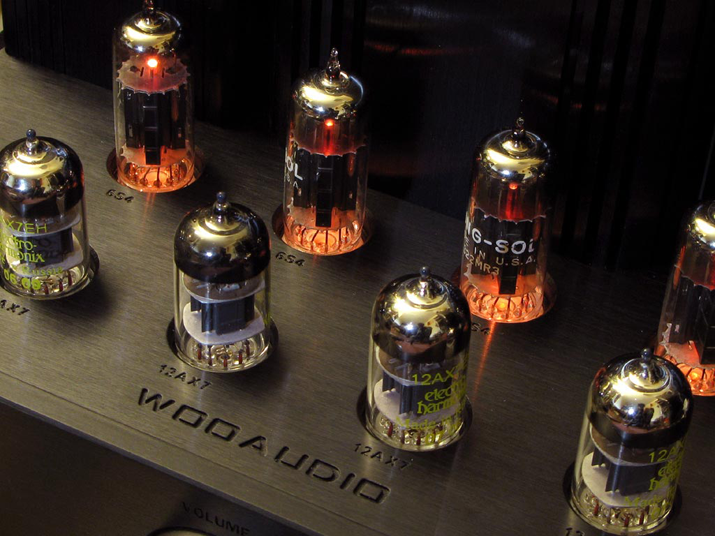 If you count on tubes to add a healthy dose of lushness, then the GES may not satisfy you -- at least with its stock tube complement. Thus far I’ve focused on the small scale, but the SR-507s could also handle the large scale. Playing densely orchestrated passages or complex studio mixes, I could clearly separate the various threads in the musical fabric, though I never felt I was being forced to do so. When a radical dynamic swing came along -- as it inevitably does in any orchestral recording -- the SR-507s handled it with aplomb. Any component that can convincingly run the gauntlet from a single violin to full orchestral tumult and bombast is just coasting when you ask it to play pop or rock. But have no fear -- I also put the SR-507s through their paces with large quantities of Jimi Hendrix, including the fabulous new Winterland boxed set (8 LPs, 1 CD, Columbia/Legacy), which arrived while I was writing the review, as well as Eric Clapton, classic Santana, and other usual suspects. (Aside from being an orchestral and jazz trombonist, I played electric guitar in a cover band that loves the music of the late 1960s and early ’70s.) The SR-507s drove the way they should, seared the way they should, and generally could wreak musical havoc when asked to. Driven by the GES, they never got overly bright or harsh unless fed the most extremely trashy modern recordings. That’s a little short of honesty, but helped to widen the range of music with which they brought pleasure rather than pain. Electrostatic headphones have the reputation of producing weak bass, and I don’t think the SR-507s will do much to deflect that criticism. To be sure, there was extension into the bottom octave -- as verified by test tones -- but the SR-507s lacked a bit of heft from the midbass down. They also forwent the hump around 100Hz that is so common among headphones and many small speakers, and that aids in the perception of bass even when the true bass frequencies are down in level. The SR-507s’ bass response was subjectively very linear, if not particularly forceful. Musically speaking, I always heard what was happening throughout the audioband, but the lowest notes of bass drums, pipe-organ pedals, and other similar instruments had a reduced sense of power and grandeur compared to live concerts, full-range speakers, and even some bass-champ headphones. The Staxes’ extremely tuneful and articulate bass let me easily groove to the many funky rhythms on Ola Onabule’s Seven Shades Lighter (24/48 FLAC, Real World Studios/Society of Sound). I couldn’t really know whether the SR-507s were delivering the full measure of this or any other electric bass -- the instrument sounds however the bassist wants it to sound by the way he or she twiddles the knobs on the amplifier or mixing board. But I’ve heard this recording through enough other headphones and speakers to conclude that it should sound a little fatter -- perhaps I should say phatter -- than the SR-507s delivered it. I turned again to well-recorded acoustic music and found that double basses were indeed a little lighter than, ideally, they should be. The SR-507s certainly didn’t sound thin; but if you’re looking for robust bass that will make up for the less physical nature of listening through headphones, this isn’t it. The final aspect of the SR-507s’ sound that requires consideration is the way they portrayed spatial information. In my experience, no headphones can image like a good pair of speakers, but there are myriad ways to not image like speakers. To a certain extent, the brain adapts to the way each headphone presents sound in order to reconstruct something sensible out of it. Different people will also experience these effects differently. I can write only about my own experiences, but other friends who heard the Stax-GES setup reported findings similar to what follows. With naturally miked recordings, I heard a soundscape that extended from left to right significantly outside my head, and in front of me as well. With closely miked studio recordings, voices ended up inside my head rather than in front of it. The Staxes’ exceptional transparency and detail delivered an astounding sense of depth when the recording contained that information -- such as on the disc of violin concertos by Ole Borneman Bull with soloist Annar Follesø and Ole Kristian Ruud leading the Norwegian Radio Orchestra (SACD/CD/Blu-ray, 2L Records 2L-067-SABD). They also allowed me to hear a little more space from the SACD than from the 24/192 FLAC download of the same recordings from 2L’s test bench, which I’d burned to DVD-Audio disc for playback through the same Ayre Acoustics C-5xeMP universal player. Follesø’s violin had a little more bite in the PCM version, and was a little bit smoother on the DSD. I don’t know which rendition was closer to the actual microphone feed. I could happily live with either, but I’d really like to hear the 24/352.8 master from which they were both derived -- or, better yet, have been there to hear the live event. Over the past year I’ve heard many of the top-of-the-line headphones that can be driven by normal means: the HiFiMan HE-500, Audeze LCD 2, Sennheiser HD 800, and Ultrasone Edition 8, which range in price from $899 to $1599. These designs sound markedly different from each other, and I found things to like about each. In terms of detail, transparency, and accuracy of transients, the Stax SR-507s ran circles around all of them. The HiFiMans have a little more bass weight than the Staxes, the Audezes and Ultrasones considerably more. No headphones can deliver the visceral punch of a good pair of loudspeakers, but the Audezes and Ultrasones come much closer to doing so than did the Staxes. The Sennheisers’ bass is highly dependent on the amplifier used to drive them. With my reference headphone amp, a Grace Design m902, the HD 800s’ bass is extended, but significantly weaker and more diffuse than the SR-507s’. Driving the Sennheisers with the HeadRoom Balanced Ultra Desktop amplifier, I found them much more similar to the SR-507s in the bass -- perhaps with a slight nod in the Sennheisers’ favor with respect to punch, though those still fall short of the Staxes in bass tone. The SR-507s got close to a neutral tonal balance, but the GES pushed them to the warm side of the line. The Ultrasone Edition 8s are also close to neutral, though they’re a touch brighter and edgier than I would like, and their bass is just a bit too high in level to be considered strictly accurate, but I don’t think many listeners would complain about that -- I wouldn’t. The Sennheiser HD 800s combine midbass warmth with a little mid-treble sparkle, and have a recessed upper midrange that robs voices and instruments of a bit of their timbre. The result is a very smooth sound that many listeners find appealing. The Audeze LCD 2s intentionally deviate from neutrality, going for a rich, lush sound centered on the lower midrange that is extremely forgiving of poor recordings. What I appreciate most about them is the way they make even some of the worst recordings thoroughly enjoyable. As an audiophile, I would steer clear of them; as a music lover with a vast collection of recordings of a wide range of sound qualities, I absolutely understand why they’ve won such a devoted following. The HiFiMan HE-500s might have the most neutral balance of the bunch, but their slightly overdamped sound and slight smearing of fine textures make them less than ideal for well-recorded acoustic instruments and voices. Each of these headphones handles spatial information in a different way. The HiFiMan HE-500s image more or less like traditional full-sized headphones: the soundstage runs from left to right through the head rather than much in front of it. They do manage to image fairly well outside the head to both sides, and can convey some of the depth of good recordings. The Ultrasone Edition 8s use a driver positioned to fire up and back toward your outer ear. The AES paper on this subject suggests that it doesn’t work equally well for all listeners, but it works for me -- I found the Edition 8s to faithfully represent what was on the recording. If there was little or no space between the microphone and the singer or instrument, that’s what I heard. If the recording was made naturally in a large hall, I could tell that -- though the sense of space was not enormous, and notes tended to decay a little faster than they ought to. The Audeze LCD 2s use large planar magnetic drivers that are angled back toward the ears. Whether because of this design characteristic or some extra resonance in the enclosure, the LCD 2s always move the image out in front to create the sense of a large recording venue -- usually, somewhat larger than what I think is actually on the recording. The Sennheiser HD 800s also use large angled drivers, and definitely create the biggest sense of space with every recording, moving the whole sonic image well to the front. In that way, they’re the most like listening to speakers of any headphones I’ve heard, and for some listeners that will make them the winners. Others, though, like me, aren’t looking for a speaker-like listening experience with headphones. For us, the HD 800s sound too diffuse and far away. With electrostatic headphones, you don’t have nearly as many choices of amplification as you do with regular headphones, but you do have some. The most obvious competitor to the WooAudio GES is Stax’s own SRM-006tS amplifier ($1399), a hybrid design that uses a FET input stage coupled to two 6FQ7/6CG7 dual-triode tubes in the output stage. The SRM-006tS is more flexible than the GES, having three inputs (including one balanced XLR), pass-through capability, and provisions for simultaneously driving two pairs of Stax ’phones. It is also slightly smaller, weighs less, and runs cooler. But the crucial difference is how they sounded. Driven by the SRM-006tS, the SR-507s had a similar level of detail but even faster transients than when driven by the GES. While the GES made the SR-507s sound a touch warmer than strict neutrality, the SRM-006tS pushed them over the line in the other direction, making them a little bright and hard. The SRM-006tS also reduced the bass output, further contributing to that thinner, brighter sound, and there was a little more space between me and the performers. From the standpoint of strict neutrality, the perfect amplifier for the SR-507s would lie somewhere between the GES and the SRM-006tS. While I could appreciate many of the performance characteristics of the SR-507s when driving them with the SRM-006tS -- transient speed, detail, clarity, transparency, texture, and, to a certain extent, timbre -- I could never really enjoy listening to them that way. An audio engineer might prefer the sound of the SRM-006tS, and would certainly appreciate its additional features and lighter weight, but I think that almost anyone who listens to music for pleasure rather than analysis will prefer the slight added warmth and additional bass of the GES. Electrostatic headphone systems have a reputation for being expensive. That’s rubbish. The SR-507s’ price of $1099 lies squarely in the middle of those of the other top-quality headphones currently on the market. You do need a dedicated amplifier to drive electrostatic headphones, but I can’t imagine anybody wasting the performance of those other top-shelf designs by plugging them directly into an iPod. The $1450 price of the GES is comparable to that of other high-quality headphone amps -- and significantly less than some. Stax offers headphones and amplifiers at prices higher and lower than the components reviewed. I don’t know how they sound, but I may have to look into them. In short, there’s no economic reason to avoid electrostatics. No headphones or headphone systems are perfect -- nor is any other audio component or system. 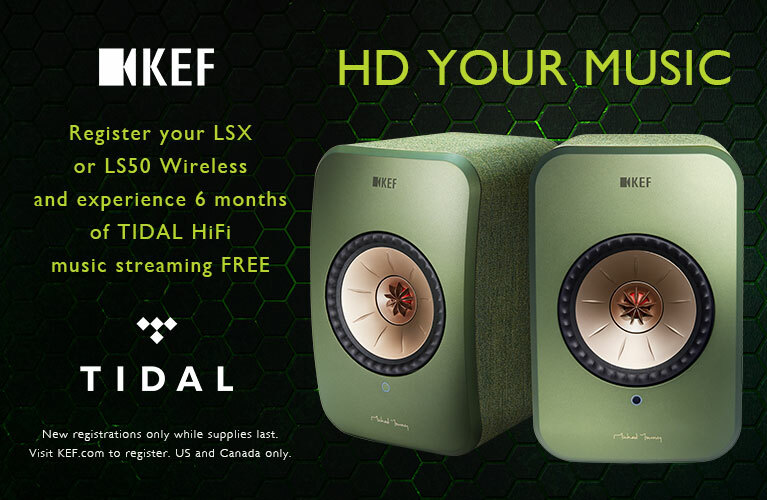 None will sound like loudspeakers (if that’s your goal). Nor do all listeners have the same preferences with regard to sound. If you’re looking for authoritative bass with visceral punch, or need to be isolated from your surroundings -- or if others need to be isolated from your music -- these are not the headphones for you. But if you value detail, transparency, openness, and timbres and textures just to the warm side of realistic, regardless of volume level or musical complexity, then the combination of Stax SR-507 Lambda Signature headphones and WooAudio GES amplifier is far and away the best I’ve heard. You may be able to do better, but I have a feeling that it will cost you a lot more. If you audition this system, you’d better be prepared to keep it. I’m keeping this one, which makes it a de facto Reviewers’ Choice.